Hello, DNA. Personalized Genetics Is Here, With GoalGetter! Drumroll, please… it’s a brand new year, and we’re excited to reveal a brand new tool to help take your wellness mission to the next level – with DNA! GoalGetter is the freshest addition to the InsideTracker family of products, and true to its name, it uses the power of your genes to help you get closer to your health and performance goals. Whether you’re excited about working towards a “new you” in 2018, or just looking to improve the already awesome “old you”, GoalGetter can help you get there. Nearly two years in the making with our scientific experts hard at work, GoalGetter marks our foray into the personalized genetics revolution. 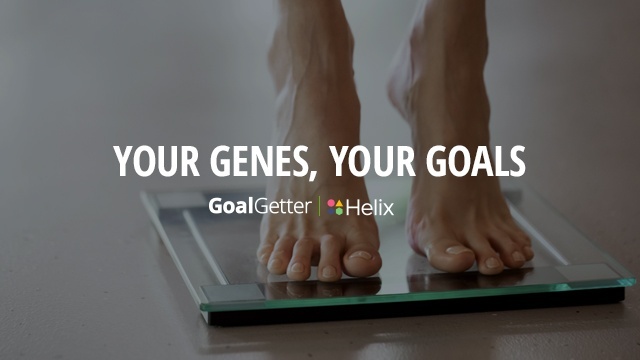 GoalGetter is the first and only product of its kind to use your DNA to tell you which goal best fits your genes. At InsideTracker, we’re longtime veterans of the personalized wellness world: give us your blood test results, and we’ll give you a one-of-a-kind action plan based on your body and your goals. With GoalGetter, we’re taking that a step further by using your DNA. Forget setting New Year's resolutions that you think you need. Use your DNA to help guide you to the goal that fits your body best, and unlock your genetic potential with customized insights and a personalized action plan based on what makes you, you… your genes. Buy, spit, sequence, results! No blood, no lab visits, no needles. Of course, there’s more that goes on behind the scenes, but from a user's perspective, it’s easy as pie (we're not recommending you eat some, though). InsideTracker has partnered with Helix, a leader in personalized DNA testing, to provide DNA collection and sequencing. GoalGetter is now sold exclusively on the Helix marketplace, and you can scoop it up by heading over to the GoalGetter store page. After you provide your saliva sample and your DNA is sequenced by Helix, InsideTracker analyzes 261 of your genetic markers, and that’s where GoalGetter is born: we generate a personalized genetic report with insights unique to your body and one of four key goals, and GoalGetter guides you through the results of your genetic data to help you create a customized DNA-based action plan. 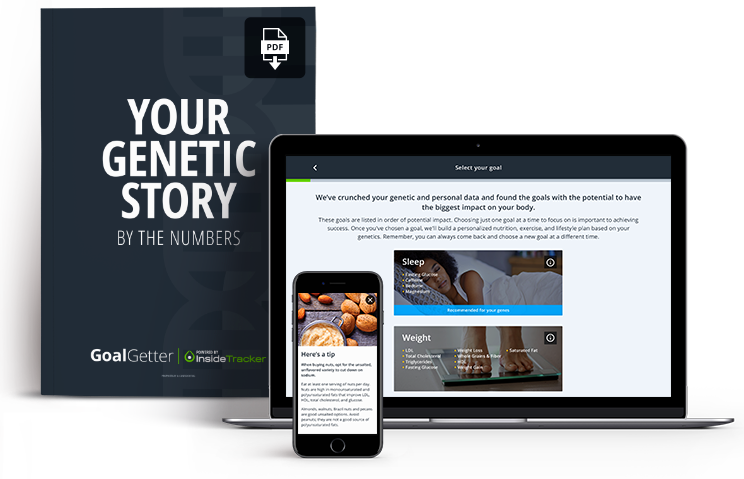 The good stuff: with GoalGetter, you’ll get your very own book, called Your Genetic Story. It might not be one for bedtime with the kids, but it is one you’ll want to keep on your shelf. 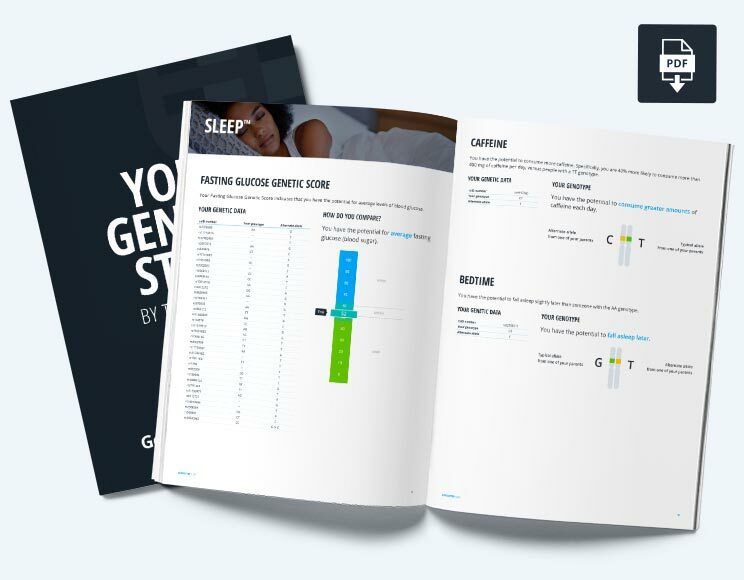 Your Genetic Story is a personalized, downloadable eBook that illustrates your genetic results, organized by four important goals: Weight, Sleep, Performance, Healthy Aging. It also includes a section on genetic Food Sensitivities. In addition to your personalized eBook, which is chock full of genetic detail, you’ll gain access to the GoalGetter online platform, accessible from any mobile, laptop or desktop device, where you’ll be guided through your genetic results, select the goal that’s best suited to your genes, and create a DNA-based action plan to help you get after that goal! Just like with InsideTracker’s blood-based products, you have the ability to set new goals, create reminders, download recipes and other tips, and check-in to keep yourself on track! GoalGetter analyzes the genes that influence glucose, cholesterol, response to carbohydrates, inflammation, and saturated fat metabolism to determine your genetic weight potential and create actionable recommendations for you to follow. GoalGetter analyzes the genes that influence athletic endurance and strength, injury risk, testosterone, B12, oxygen transport, and red blood cells to determine your genetic performance potential. And, to help you achieve your potential, you’ll get actionable recommendations that can help you improve your performance. GoalGetter analyzes the genes that influence caffeine response, bedtime, magnesium, and glucose to determine your genetic sleep potential and create actionable recommendations to help you sleep better. GoalGetter analyzes the genes that influence vitamin B12, vitamin D, calcium, liver enzymes, inflammation, glucose, blood pressure, and white blood cells to find out how your genetics may affect your aging. Plus, you’ll get recommendations on how to age as healthy as you can based on your DNA. 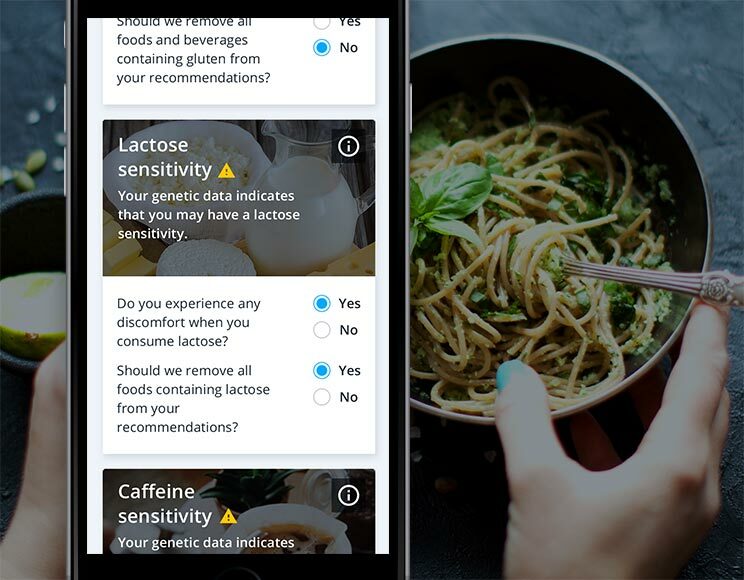 While not considered a goal, your genetic potential for food sensitivities can influence your dietary choices and the personalized recommendations GoalGetter makes. The genetic food sensitivities we analyze are to caffeine, gluten, and lactose. We also test for predisposition to having a peanut allergy. If you know anything about us, you know we’re serious about science. InsideTracker’s scientific founder, Dr. Gil Blander, and the chairman of our Scientific Advisory Board, Dr. David Sinclair, are geneticists who have been working together on the InsideTracker platform for 7 years. We’re excited to finally see genetic science and technology beginning to catch up to consumer expectations. “The time has come for DNA to improve the lives of millions of people. We are proud to be a leader in bringing to the customer next-gen advances in personalized nutrition, wellness, and performance,” says Dr. Sinclair, Professor of Genetics at Harvard Medical School. GoalGetter is the result of years of work and incorporates InsideTracker’s science-backed algorithms and technology that have long powered our blood biomarker-based products. While DNA can’t tell you everything about your past, present, and future, it can reveal your potential for certain traits and adds yet another layer of scientific insight to the overall picture of your body. DNA is all the rage, and we’re sure you have more questions than we can address in a single blog post. That’s why we created a special addition to our FAQ page just for GoalGetter™. Plus, over the next few months, we’ll be adding a series of educational blog posts on the topic of DNA… rest assured, there’s plenty of good stuff on the way! Of course, if you can’t find what you’re looking for on the FAQ page, or you just can’t wait to learn more about GoalGetter, we’re always on hand to chat with you. Reach us right here on the site in the chat window, or by email at goalgetter@insidetracker.com. *For now, GoalGetter is only available to our US-based customers. We love you all the same, international friends, but technical hurdles exist in even the best of times, and we’re working with Helix to create a solution for our overseas users. Stay tuned! Learn how your biomarkers affect your body in this FREE e-Book download!